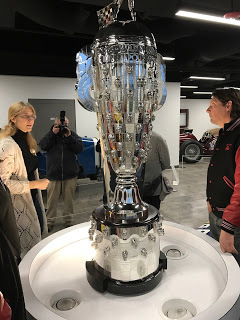 Our crew began the day with a fantastic tour of the Indianapolis Speedway and its museum in Speedway, IN. 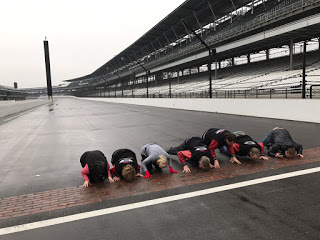 Ellen and her museum team were terrific hosts as we explored the historic cars and got a bus tour around the “brickyard” track that included a chance for the ceremonial kissing of the bricks at the finish line. 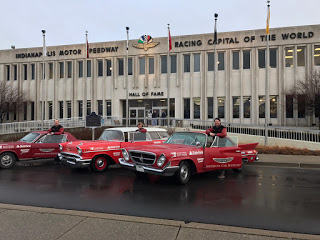 After that, the trip north to Grand Rapids got very interesting very fast. 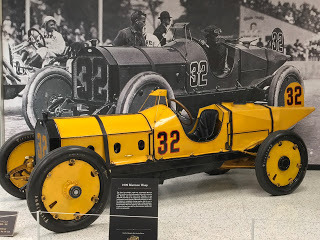 I was driving the Mustang up Highway 31 near Peru, IN at 60 mph following Derek in the Chrysler 300 when his rear right wheel caved outward, the axle dropped to the pavement and sparks flew backward about 30 feet until he was able to guide it toward the side of the road to safety.